this is a spot to post pics of your favorite mutt cause you know we all like to look at them. Well i should actually say the Ranger CAV and the marines were FAV. The plate I have was on all the ranger ones. Yep that's the plate. Guys they are being repoped by scott Watson at rfjp. Ken is that the photo I sent you? Also TACOM has no info on these jeeps as they do seem to be just a short lived thing. Have tons of photos now of them in operation and in training. Several 75th ranger guys have contacted me about them and we have cheated alot about the designs. So far we know of 3 designs. The radio jeep which I know of 1 left, the "standard" which is what everyone seems to have with the 2 jerry cans on the back. Then the heavy weapons one with ammo cans on the back and jerry cans on the sides. We know of only one model like this also. Joe_rceme wrote: Yep that's the plate. Guys they are being repoped by scott Watson at rfjp. That’s some interesting information. So I guess mine are the standard and the radio ones. The hard top one has a rack in the back with quite a few radios set up back there. Yes if yours it the set that sold off ebay a few years back I think from texas you have the only radio version. I have been wanting to see how that was all set up. CBrinker I sent you a message. Joe_rceme wrote: Yep that's the plate. Ken is that the photo I sent you? Also TACOM has no info on these jeeps as they do seem to be just a short lived thing. Yes, that's the picture you sent me. I doubt if TACOM was involved in the creation of the Combat Assault Vehicle. The stories I've heard suggest that only a handful of CAVs were prepared but I also heard that Warner-Robins AFB was somehow involved in all this. My experience of trying to get information out of W-R reminds me of two things....blood and stone. At a UK airshow just after the end of the Iraq invasion, we talked with an SOF officer who mentioned that his group used "modified M151s" as airbase seizure vehicles....he knew enough about mutts because the group had their own M718 which they had converted to M151A1 specs and used it as a base runabout. I'm convinced he wasn't talking about Chenowths or IFAVs. Ken, tacom only has docs about the mods but zero specs and info. They show about 20 were made in 3 versions of only one radio jeep, 5 heavy weapon versions and the rest were standard as we have come to call them. We have several photos of them being used by the 75th rangers and one unknown unit doing testing. So far I have with help from another owner tracked down 7 jeeps. We know where one of each version are now. Most sadly are rebuilt from cut parts. Only 2 we know of are uncut. Ken just tried emailing you not sure if went through, also my messages wont go through either here. It would be quite a contribution if the owner of these rare variants would post a detailed retrospective with photos and measurements from bumper to bumper before doing anything else. Having not one, but two presents quite an opportunity (one that is often lost by some overzealous owners who are too anxious to dive right in). I realize it is his time and his effort I'm suggesting be spent. Perhaps one of the gang nearby would offer to team up with him to get this done? Fav and cav's, they aren't going anywhere fast with all that weight and huge tires. Reminds me of a Horse/mule with 600 lbs on it. Cool eye candy though. !! I can certainly post more pictures of them soon and get any measurements anyone wants. I don’t plan on changing anything about them besides getting them running and cleaning them up a little. The “standard” one is now up and running so I can get more pictures of it in good lighting, but the radio Jeep is still packed in the box truck for a while until I make the space in the shop to work on it and store it in there. 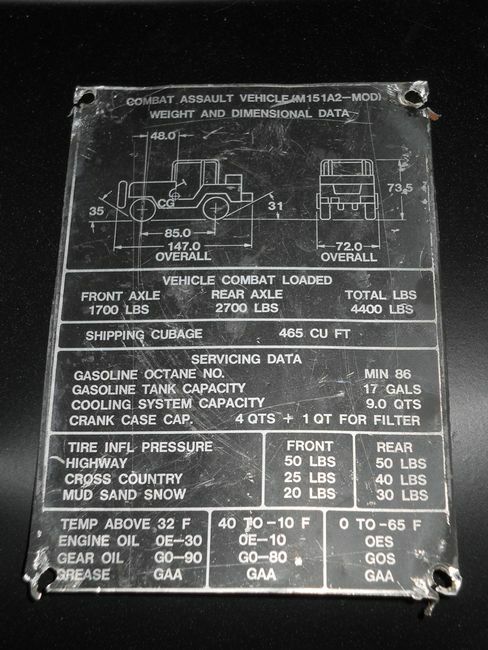 earlier in this topic I posted a picture of the "Weight & Dimensions" plate for the Combat Assault Vehicle. What I'd really love to see are the actual dash-dataplates for any of these vehicles. Are the dash-plates specially designed (like the W&D plates) or are they the original style? Would be interesting to see which Contract the Mil chose to select from.